Come join the fun, tour the facilities and talk to the directors. Door prizes and special discounts available at the Open Houses. All registrations are done online. Go to WHschool.org/summer and click on “Register and Pay Online”. Please add all siblings onto the same parent account. Applications are processed in the order that they are received. No application will be processed without the medical information form, immunization or the appropriate fee. Registration is ongoing and continues throughout the summer as long as space is available. If you try to register and you do not see the class/camp week, please call the summer office as the system closes classes/camp weeks the Sunday before they begin. Early registration is suggested as some of the activities and classes have a maximum of 18 participants. We reserve the right to cancel a class if we do not have sufficient enrollment for that course. Before camp/school begins, you will receive information in the mail with information and a campus map. Please check it carefully and report any discrepancies immediately to the Summer Programs Office at (908) 754-1882, Ext. 319 or dostrowski@whschool.org. Summer Scholar Early Bird Bonus: If your application, medical sheet and immunizations and full payment are received by April 1, 2019 or at the April Open House, you will receive a $100 discount per student. Student must be registered for a credit course or at least two sessions. Available only for Summer Scholar academic courses. New Family Referral Bonus: If you had attended the WH Summer Programs and refer a New Funshine or Adventure Camper, or Teen Leader who signs up for at least two full weeks, or a Summer Scholar student that takes at least two 60-hour classes, you will receive a $50 bonus check at the end of the summer for each valid referral. The new camper/student or any member of their family must not have attended any of The Wardlaw + Hartridge School Summer Programs previously. A referral form is required. Please see Debbie Ostrowski in the Summer Programs Office. Requirements: You have to had attended in 2018 and no one in the new family must have ever attended before. 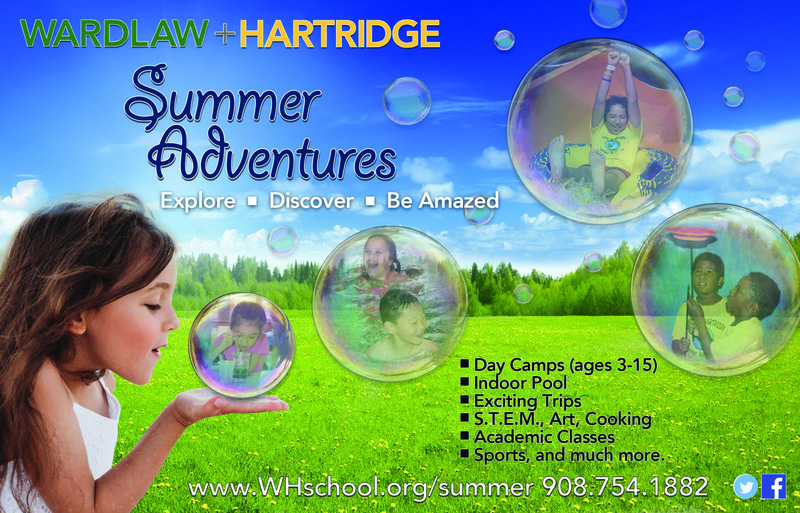 W+H Student Advantage: Any camper/student that is fully enrolled (with deposit) to attend Wardlaw+Hartridge School for the 2019-2020 school year at the time of registration will have the registration fees waived. You must inform us before you register and we will check with the Business Office. Payment for Summer Programs, including aftercare fees can be made by mail or in person by check in the Summer Programs Office or by credit card online. Make all checks payable to: The Wardlaw Hartridge School and write the names of your child/ren on the memo section of the check. Cash payments are not accepted in the Summer Programs Office. A special note to Wardlaw-Hartridge parents – please do not combine camp fees with regular school payments, as they are separate accounts. For Camp Funshine, Adventure, Teen Leadership, Sewing, and Drama Camps - Withdrawal from camp must be made at least two weeks prior to the registered week for a refund. During any given camp week, refunds will be given only if your child is absent for three consecutive days due to illness and a dated doctor's note is submitted. Registration fees are not refundable. Please note: If payment was made via credit card, credit card fees will be deducted from the refund (3%). For Academic Summer Classes and Brain Boosters - Withdrawals any time before May 1st will result in all but $250 of the school fees being refunded. Withdrawals between May 2st and May 31st - 50% of the school fees will be refunded. After June 1st there are no refunds. Please note that the registration fees are not refundable and not part of the school fees. Cancellations due to insufficient class size will be refunded at 100% including registration fees. Please note: If payment was made via credit card, credit card fees will be deducted from the refund (3%). Extended care is available for all campers and students who are in camp or classes from 8:30AM to 3:00PM and in grades PreK - 10th grade. Before Care: 7:30AM - 8:30AM - must pre-register - $10 per morning. Before care will take place in the gym for grades 1- 10, or Funshine room for Preschool. After Care: 3:00 PM - 6:00 PM - pre-registration is not necessary. $5 per half hour or any part of the half hour. After 6:00 p.m., a late fee of $2 per minute after 6:00 pm will be billed. Campers and students will be automatically signed into after care if they are here at 3:15 PM. After care children will be in our "Encore" room and/or playground. Children are to be picked up at the entrance by the playground. Extended care charges will be billed separately and must be paid promptly. For safety reasons, Summer School students may not remain in the school or on the grounds for more than 15 minutes before or after school. Funshine, Adventure, and Teen Leadership campers, also sewing and drama campers must bring their own morning snack. Summer Scholars may bring a snack or purchase a snack during their morning break (cash only). Lunch and afternoon snack is free for Funshine, Adventure, Teen Leadership, Sewing, and Drama campers. Lunch is free only to those Summer Scholar students that are registered for an Afternoon Electives class. All meals will be served with a drink choice of milk or juice drink, and fruit. Vegetarian options are available daily. It is a state regulation that the confidential Medical Information Form be completed for each camper/student before they can attend camp or classes. This form will be kept with our camp nurse. Applications cannot be processed without this form. This form does not need to be filled out by a doctor but a list of immunizations is required. A new form needs to be filled out each year. All medications and epi-pens must be provided and given to the nurse before camp or classes begin. Campers and students should dress in casual, comfortable but appropriate clothing. Please avoid clothing that is distracting or distasteful (as determined by the Summer Programs director) All Camp Funshine, Adventure and Sports campers must wear sneakers or sandals with covered toes and back straps. Footwear and clothing must be appropriate for running, jumping, and active play. If girls want to wear sundresses, they must wear shorts underneath them. Camp Funshine, Adventure Campers, and Teen Leadership campers will be given a camp shirt their first week of attendance. Camp shirts must be worn on all camp trips. If a camper does not have their camp T-Shirt on a trip day, parents will be billed for a new T-Shirt ($10) to wear on the trip. Campers should label all clothing, towels, camp shirts, swimsuits and personal items (such as goggles, flip flops). Wearing jewelry is not recommended. The camp is not responsible for lost personal items. The Wardlaw + Hartridge School is a place where all children feel welcome and safe. Therefore, we reserve the right to dismiss any child from our programs who is disruptive, exhibits any behavior that intimidates or threatens the camp or school experience of any other camper/student, is destructive to school property or grounds and/or for any other reason deemed reasonable by any of the Summer Programs Directors. Please direct any issues or concerns to the Director or to the Summer Programs assistant. We will always make time to meet with you. Due to NJ health regulations, all children attending Camp Funshine must be fully toilet-trained. Accidents do occur and our staff is prepared to react in a compassionate and reassuring manner. However, if incidents occur more than once a week, the child may be dismissed from camp. All camps and classes will be closed on July 4th & 5th, 2019. The Wardlaw + Hartridge School is a top private and college prep school in Edison, New Jersey, which provides an independent, pioneering educational experience at the early childhood, kindergarten, elementary, middle, and high school levels.